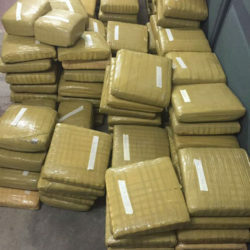 Ranks from the Customs Anti-Narcotic Unit (CANU) yesterday afternoon unearthed 1,275 pounds of marijuana which was hidden in a container that had recently arrived from Jamaica. Head of CANU, James Singh confirmed the bust which was made around 13:00 hours yesterday at the John Fernandes Wharf, Water Street, Georgetown. Two persons have been taken into custody and are assisting with investigations. Stabroek News understands that the drug was found in 21 bags which comprised 260 packets of marijuana. The container which arrived in Guyana from Jamaica about one week ago was carrying heavy- duty machinery.